Please call Bluegreen Travel Services at 800.459.1597 to learn about similar Mediterranean cruise tours. Airfare to Rome not included. Booking deadline is November 30, 2019. Single accommodations may be available on this adventure; call for availability and pricing. Journey back in time and experience the rich history, art, traditions and antiquities of the Greco-Roman world. Visit three countries—Italy, Greece and Turkey—on this Mediterranean Odyssey. The adventure starts with a 3-night stay in Rome and a Welcome Reception. Private group excursions over the next two days highlight the best of the Eternal City. See the Roman Forum, the heart of ancient Rome, and enter the Roman Colosseum via the Emperor’s door directly onto the arena floor where gladiators once battled. Visit the Vatican Museums and marvel at Michelangelo’s ceiling paintings in the Sistine Chapel. Step inside St. Peter’s Basilica, the largest church in the world. After your stay in Rome you’ll board the Explorer of the Seas, a Royal Caribbean International® ship, for a 9-night Mediterranean cruise. Explore the archaeological site of Ephesus on a guided tour, strolling the 4,000-year-old marble streets to view the ornate Hadrian Temple, the 25,000-seat amphitheater and the recently excavated Terrace Houses. In Athens stop at the Olympic Stadium, built on Roman foundations for the first modern games held in 1896. Climb the marble steps to the Acropolis as visitors have done for centuries and be awestruck by the Parthenon, the most perfect example of classical architecture in the world. At Naples you’ll have an excursion to the beautiful Island of Capri. Take a thrilling chair lift ride up Monte Solaro and a boat ride to Capri’s most famous attraction, a stunning sea cave called The Blue Grotto. 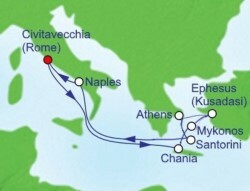 Experience the delights of Chania, Mykonos and Santorini, Greece, on your own, or book an optional tour in these ports. Bid your fellow travelers aντίο or perhaps arrivederci at a Farewell Cocktail Reception aboard ship before your Owner Adventure ends where it began, in Rome. PLEASE NOTE: Cruise itinerary is subject to change by the cruise line. Guests who have booked this adventure will be informed of any itinerary changes as soon as the cruise line makes Bluegreen Travel Services aware of them. Welcome to Italy’s sprawling, cosmopolitan capital city! You will be met at the airport and enjoy your first glimpse of Rome as you are transferred to your hotel, where early morning check-in is guaranteed. Meet your Bluegreen hosts and fellow owners this evening at a Welcome Cocktail Reception. Overnight in Rome. After breakfast at your hotel, you’ll have a full-day Imperial Rome private group excursion to the archaeological area of Rome, representing 12 centuries of Roman cultural, political and religious history. From the Colle Oppio Terrace your local guide will tell the story of the Roman Forum, the heart of ancient Rome. Then take the fast track line inside the Roman Colosseum, a masterpiece of classical architecture. This enormous amphitheater is where gladiators, Christians and wild beasts once battled to the death in front of 50,000 spectators. Head next to the city center, where you’ll have a walking tour through narrow, twisting streets to the Trevi Fountain, the largest Baroque fountain in the city. Legend holds that if you throw a coin in the fountain with your right hand over your left shoulder, you are ensured a return to Rome. Continue to the Piazza della Rotonda, site of the 1,800-year-old Pantheon. The building’s dome, at more than 142 feet high, was the largest dome in the world until the Florence Cathedral was constructed in 1436. You’ll have free time for lunch on your own during the walking tour. This evening is yours to experience Rome at your leisure. Breakfast is included today; overnight in Rome. PLEASE NOTE: This tour involves intense walking and extended periods of standing. Today travel to Vatican City, an independent city-state surrounded by Rome and the headquarters of the Roman Catholic Church. Your full-day Vatican Museums excursion starts in a very special area, the Vatican City Gardens, a place of quiet and meditation for the popes since 1279. Only a few visitors are allowed into the gardens each day. Next take a guided visit of the galleries of the Vatican Museums. Enter the Sistine Chapel and admire the ceilings painted by Michelangelo between 1508 and 1512. Step inside St Peter’s Basilica, the largest church in the world; among the many fine pieces of art and mosaics on display are Michelangelo’s Pieta and the beautifully carved Bernini Pulpit. After the tour enjoy a typical three-course Italian lunch in a local restaurant and some free time before returning to your hotel. On your last evening in Rome, perhaps experience Roman nightlife on your own, or rest up for the next part of your adventure. Breakfast and lunch are included today; overnight in Rome. PLEASE NOTE: A strict dress code is enforced in the Sistine Chapel and St. Peter’s Basilica. Short pants, tank tops and revealing clothing are not acceptable. Guests may be required to check large bags, backpacks, video cameras and/or personal water bottles at designated checkpoints. Flash photos are not permitted in the Vatican Museum. Video and photography are not permitted at any time in the Sistine Chapel. Following breakfast you will take a motorcoach to the the cruise port, which is about 50 miles from Rome. Board the Explorer of the Seas, a ship that allows you to soak up views of Mediterranean shores from many vantage points. Breakfast at hotel; lunch and dinner aboard ship; overnight aboard ship. Feel the warm sea breezes as you sail to Greece. There’s no end to the fun available on this ship. Watch outdoor movies by the pool, climb forty feet above deck on the signature Rock Climbing Wall or take a turn on the ice skating rink. Entertainment includes everything from Broadway-style musicals, intimate pub shows and casino action. With 15 bars, clubs and lounges, there are plenty of places for dancing and socializing. Breakfast, lunch and dinner aboard ship; overnight aboard ship. Chania’s ancient buildings bear marks of many battles fought here throughout the centuries. Check out the town on your own, or book one of the many optional excursions offered by the cruise line. Wander the narrow streets lined with shops or seek out waterfront restaurants serving local fare like zucchini fritters and sardines stuffed with herbs and sun-dried tomatoes. Visit impressive Aptera, an active archaeological site, or the Archaeological Museum housed in the Church of San Francesco, which stores artifacts dating from Neolithic to Roman times. Discover the sandy beach at Stavros Bay where Anthony Quinn danced in the 1964 movie Zorba the Greek. Breakfast, lunch and dinner aboard ship; overnight aboard ship. With its powder white houses and sparkling blue waters, the Island of the Winds is as colorful as the people who call the island home. You’re free today to walk the narrow marble pathways laced with purple bougainvillea blooms or go cycling past Ano Mera village. Explore Greece’s maritime history at Armenistis Lighthouse and check out the Folklore Museum’s Mykonian ship models. Take a short boat ride to the island of Delos, a sacred Greek archaeological site and the mythological birthplace of twin gods Apollo and Artemis. The multihued waters surrounding Mykonos are perfect for surfing and scuba diving, while prevailing winds invite sailing and windsurfing. Hit the beach of your choice: Psaroú for family fun, Agrari for seaside serenity, Paradise for epic beach parties or Elia for a blend of all three. Breakfast, lunch and dinner aboard ship; overnight aboard ship. Your ship docks in Kusadasi, the gateway to the archaeological site of Ephesus. Excavations continue within the 4,000-year-old city, where it is believed more than half of it still remains buried. Your full-day Ancient City of Ephesus excursion begins with a pleasant drive along the Aegean Coast. Arrive at the upper entrance of Ephesus and view the majestic city from the hilltop. Then enter the site through the upper gate and walk downward. Your guide will bring the city to life as you stroll the marble streets lined with ancient architecture that was once lost from sight. View the ornate Temple of Hadrian, the baths and the recently excavated Terrace Houses. Nestled in the mountainside is the 25,000-seat amphitheater, still used today for performances during the Festival of Culture and Art. Head next to a traditional Turkish restaurant that is part of an olive farm run by a local family for a delightful Turkish lunch. While there you’ll be treated to a Turkish Folk Show of traditional song and dance. Travel next up to the hills behind Ephesus, where the Virgin Mary is believed to have spent the last days of her life, brought there by John the Apostle around 40 A.D. Your motorcoach returns to Kusadasi, where you can watch a demonstration on hand-weaving Turkish rugs and shop before you make the short walk back to the ship. Breakfast and dinner aboard ship; lunch on excursion; overnight aboard ship. PLEASE NOTE: This tour includes lots of uneven ground, some steps and approximately one and a half hours of standing/walking in Ephesus. Walking in Ephesus is mainly downhill. This tour is not recommended for guests in wheelchairs. At the end of the tour, guests will be dropped off in town, as the buses are not allowed to return them to the Cruise Ship Terminal parking lot. There is a short walk from the drop-off point in town back to the Kusadasi Terminal Building. Athens is one of the greatest cities of the ancient world and the birthplace of western civilization. Today’s full-day Essence of Athens excursion is an ideal introduction to the city. Your first stop is Olympic Stadium, a 19th-century reconstruction on Roman foundations, where the modern revival of the Olympic Games took place in 1896. Next you’ll drive by the Royal Palace, Constitution Square and the Monument of the Unknown Soldier. Take in the stunning panorama from Acropolis Hill with its spectacular view of the Parthenon and the glorious monuments on the Acropolis. Visit the Acropolis, a symbol of the glory of ancient Greece, and climb its smooth marble steps as visitors have for centuries. Stand in awe of what is considered to be the most perfect example of classical architecture in the world, the Parthenon. Looking down from the Acropolis, see the two ancient theatres in its shadow, the Greek theatre of Dionysus and the grand Roman theatre of Herod Atticus. A short drive brings you to the Plaka district to enjoy lunch with wine at a traditional Greek restaurant. After lunch you’ll have free time to wander the picturesque streets of Plaka with its numerous art and craft shops before you head back to the ship. Breakfast and dinner aboard ship; lunch on the excursion; overnight aboard ship. PLEASE NOTE: This tour is not suitable for guests in wheelchairs or those with walking difficulties. Santorini is one of the world’s most popular islands, known best for its dramatic scenery, whitewashed villages and fiery volcanic activity. Explore the island on your own today. Perhaps take a cable car to the capital of Fira, a bustling cliff-top town awash with old cathedrals, enthralling museums and cozy tavernas. Ypapantis Street in Fira has dozens of jewelry stores. Venture to the coast for a swim in the deep blue waters that lap red- and black-pebbled beaches. Or peel back layers of lava and history among excavated Akrotiri. Sample wine at a traditional wine cellar; some of Europe’s oldest vineyards are located in Santorini. Breakfast, lunch and dinner aboard ship; overnight aboard ship. Enjoy a day aboard ship to relax and refresh. Choose a comfy lounge chair in the adults-only Solarium or soak in a whirlpool on the pool deck. Join in one of the ship’s scheduled activities, like trivia and sports contests, or visit the piano bar for musical entertainment. Perhaps play a round of mini-golf, take a dance lesson or get a pampering treatment at the Vitality Spa. If you want to catch a wave, grab a board and try the Flowrider® surf similator. Before dinner you’ll have a Cocktail Reception with your Bluegreen hosts and fellow adventurers. Breakfast, lunch and dinner aboard ship; overnight aboard ship. Today we have a special treat: a full day Island of Capri excursion. A 50-minute jetfoil boat ride on the turquoise waters of the Gulf of Naples brings you to Marina Grande, the Old Port lined with colorful fishermen’s houses. You’ll have a 30-minute bus ride to the town of Anacapri, the highest village on the island. Upon arrival at the central square, you’ll take a chair lift on a thrilling ride to the peak of Monte Solaro, savoring breathtaking views of the Bay of Naples en route. Return to Capri Town, where you will have a three-course lunch with wine at a local restaurant. After lunch return to Capri pier and take a motorlaunch to the entrance of The Blue Grotto, one of the most famous attractions on Capri. This unique sea cave gets its name from the bright blue light filtering through the water by way of an opening below sea level. Visitors board a small rowboat and duck as they enter the cave through a low opening. Once inside, you’ll marvel at the glowing turquoise light. After your visit, return to the pier for the jetfoil boat ride back to Naples and the ship. Breakfast and dinner aboard ship; lunch on the excursion; overnight aboard ship. PLEASE NOTE: This tour includes extensive amounts of walking. Guests visiting the Blue Grotto must be able to climb into a small local boat and duck down to enter the cave. The visit of the Blue Grotto is subject to weather and sea conditions. In case of rough seas, the visit will be cancelled, and guests will have more time in Capri Town. The order of stops on this tour may be altered. Your adventure ends with breakfast aboard ship and a group transfer to the airport in Rome. Call 800.459.1597 to Book Your Mediterranean Adventure Today! **BLUEGREEN TRAVEL SERVICES ONBOARD CREDIT OFFER TERMS & CONDITIONS: $50 onboard credit per stateroom available when 2020 Mediterranean Odyssey Owner Adventure is booked in the advertised stateroom categories through Bluegreen Travel Services by November 30, 2019. Onboard credit may be used for select purchases aboard the cruise ship and has no cash value. New bookings only. Subject to availability. Prices are per person, based on double occupancy, for specific sailing and stateroom categories. Royal Caribbean International inclusions are 9-night cruise aboard the Explorer of the Seas and all meals aboard ship. Government taxes and fees are additional. For new reservations only. Subject to availability. Certain restrictions apply. May not be combinable with any other promotion and may be withdrawn at any time. “Deals” pricing reflects the special rate(s) you may be eligible for. Proof of eligibility required. If eligibility cannot be validated, you will be charged the standard rate or denied boarding. All prices are quoted in US Dollars. All itineraries and prices are subject to change without notice. Ships’ Registry: Bahamas. © 2011 Royal Caribbean Cruises Ltd. Royal Caribbean International Operator reserves the right to impose a supplemental charge relating to unanticipated occurrences including, but not limited to, increases in the price of fuel. Any such supplement charges may apply, at Operator’s sole discretion, to both existing and new bookings (regardless of whether such bookings have been paid in full). Such supplements are not included in the Cruise or CruiseTour Fare. Price is per person based on double occupancy, cruise and land tour only, for select sailing date and stateroom category. Owner Adventure package includes all Royal Caribbean International inclusions plus these additional inclusions: airport transfers in Rome on June 2 and 14; hotel accommodations in Rome; Welcome Cocktail Reception in Rome; breakfast during Rome hotel stay; excursions as noted in itinerary; $50 onboard credit per stateroom in the advertised stateroom categories; Cocktail Reception aboard ship; on-tour motorcoach and boat transportation; gratuities for tour guides, drivers, wait staff at meals included on excursions and cruise staff; and port and security fees and taxes. Onboard credit may be used for select purchases aboard the cruise ship and has no cash value. Prices, additional fees, itineraries and availability are subject to change without notice. Fares shown are in U.S. dollars for new reservations only and are subject to availability. For U.S. residents only, Travel Protection will be purchased on your behalf by Bluegreen Vacations when you book this Owner Adventures vacation package. A passport valid for six months past the ending date of this adventure is required for all guests. Reservations must be booked by November 30, 2019. A non-refundable, non-transferable deposit of $1,000 per person is due at time of booking. Final payment is due by January 31, 2020. Please call us at 800.459.1597 for more information. Offer includes Cocktail Reception invitation for first and second guests in cabin only. Limit one ticket per paying passenger for included shore excursions, as noted. Onboard credit may be used for select purchases aboard the cruise ship and has no cash value. Certain terms, conditions and restrictions may apply. These offers may not be combined with any other offers/promotions and may be withdrawn at any time. Not included: airfare; airline baggage fees; airport or departure taxes; travel insurance for non-U.S. residents; car rental; food and beverages outside of the contracted menus as presented at a restaurant for included meals; optional excursions; photographs; and all other items of a personal nature. Great Vacation Destinations, Inc doing business as Bluegreen Travel Services, is located at 4960 Conference Way North Suite 100, Boca Raton, FL 33431. Great Vacation Destinations is an Iowa Seller of Travel No. 688, Washington Seller of Travel No. 602-283-711; Florida Airlines Reporting Corporation (ARC) registration No. 15-72225-4, California Seller of travel registration No. 2068362 (Registration as a Seller of Travel does not constitute approval by the State of California). Void where prohibited by law and where registration and/or licensing requirements have not been meet. In the event of a conflict between Royal Caribbean International’s Details of Participation and Great Vacation Destination’s Details of Participation, Royal Caribbean International’s Details of Participation shall govern.